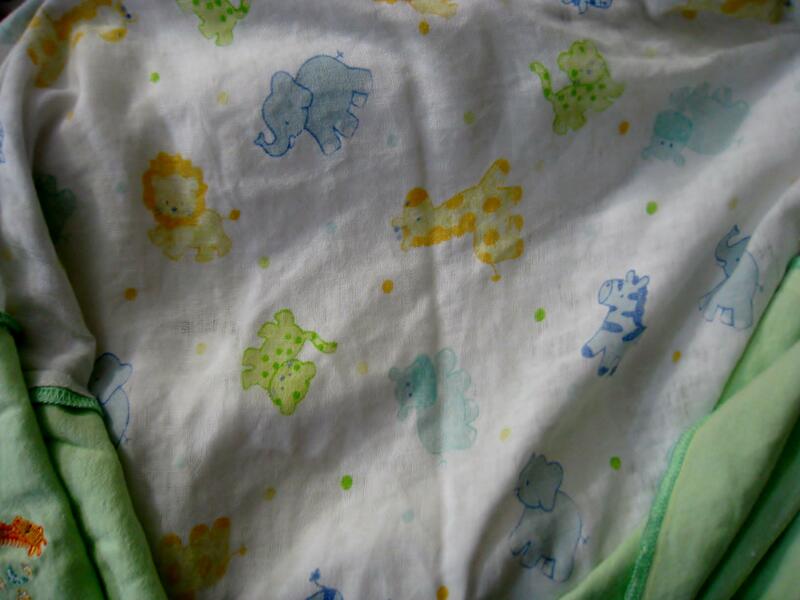 Help me find this particular baby blanket. Out of all the dozens of simple cotton receiving blankets we had, my son made this one his "lovey". Now, years later, it's threadbare and disintegrated. I'd love to have another. (note: the white animal-pattern one in the photo; the green one is another layer we added in an attempt to save the lovey). Does anyone know (a) what this particular one is or where to get it, or (b) the right niche internet community where I should post this question? The tag was likely chewed off, so we don't have any brand/line info on it. This particular pattern doesn't show up when we do obvious product searches. We were in the Bay Area of California at the time we got it, but it was already used by a previous parent. So it's at least 10 years old but could be more. Thanks in advance! In case your specific blanket doesn't turn up: Spoonflower will duplicate any pattern, to have a blanket made (perhaps in a larger size than the original). It looks like a vintage Carters pattern (we have a similar but alas not identical set of carters baby sheets from the same era).